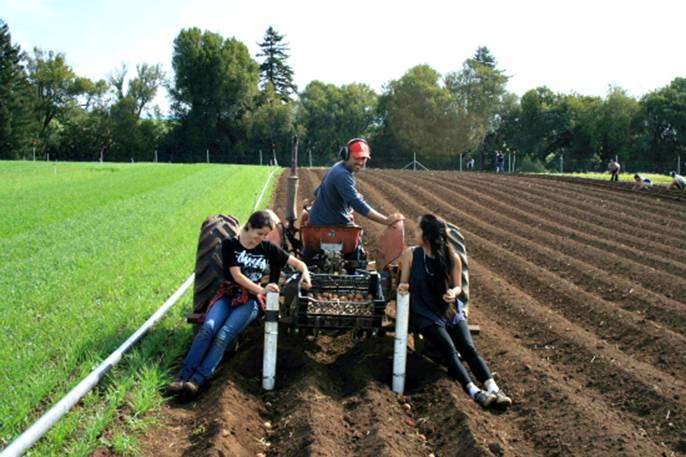 Darryl Wong, a UC Santa Cruz farm manager, works with undergraduate interns in agroecology as they plant potatoes on the UC Santa Cruz farm. As their peers settle into lecture hall seats, two dozen UC Santa Cruz interns grab a harvest bucket, a set of pruners or a digging fork and head out to the fields and orchards of UC Santa Cruz’s organic farm and gardens. They’ll spend the morning working at whatever the season demands: planting, harvesting, pruning, making compost or packing crops for the campus dining halls. The interns are part of an evolving effort by UC Santa Cruz’s Center for Agroecology and Sustainable Food Systems (CASFS) to integrate undergraduates into the seasonal work of the campus’s 33 acres of organic farmland and market gardens. With support from the Clarence E. Heller Foundation and a U.S. Department of Education Higher Education Challenge Grant, CASFS staff and UC Santa Cruz faculty have crafted an internship program that complements the environmental studies major’s new concentration in agroecology and sustainable food systems. Beginning this fall, environmental studies majors have been able to add a concentration in agroecology and sustainable food systems to their undergraduate major. The major academic objective is to provide students with a depth of expertise within the environmental studies major. Students will learn about ecological concepts that can be applied to the development of sustainable agricultural systems and also will develop their understanding of social, political and economic aspects of agriculture. Students also will have access to hands-on experiences, and obtain skills in research, fieldwork, production and communication. Internships aren’t a new concept for CASFS; UC Santa Cruz students have been seeking opportunities to get their hands dirty since Alan Chadwick arrived to start the Student Garden Project (now the Alan Chadwick Garden) nearly 50 years ago. Interns in the program spend three four-hour sessions a week working on UC Santa Cruz’s organic farm. They also discuss readings about sustainable agriculture and meet with their faculty sponsor to talk about how the internship may help them shape their career interests. That work includes being part of a team of undergraduates who plant, grow, harvest and deliver organic food to their own dining halls and to supply a weekly “pop-up” produce stand in the heart of campus. For students it creates a direct connection to the campus food system, and as Wong explains, “It’s helping to meet the goals of the campus’s Real Food Challenge,” a commitment to source 40 percent of UC Santa Cruz Dining’s food from local, sustainable sources by 2020. Interns also plug into ongoing research projects taking place at the CASFS Farm, including current research on organic alternatives to soil fumigants for growing strawberries and a study on root maggots in organic cropping systems. The internship revolves around the seasonal work at the CASFS Farm and Alan Chadwick Garden. In spring, interns spend time in the greenhouses and prepare and plant beds; in the fall they harvest and pack crops for delivery to UC Santa Cruz’s dining halls and sow cover crop seeds; and in the winter they pitch in with fruit tree care and making compost. Damian Parr, education coordinator for CASFS, says the internship program is designed to complement the annual Apprenticeship in Ecological Horticulture, a six-month, full-time residential training in organic farming and gardening offered by CASFS. In place for nearly five decades, the apprenticeship has laid the groundwork for the thriving educational and research farm and gardens that are available to UC Santa Cruz students and faculty. Interns benefit by working directly with the CASFS apprenticeship instructors, who have decades of experience in teaching both the theory and practice of agroecology and sustainable agriculture, as well as a background in what it takes to grow organic food on a commercial scale. Thanks in large part to the apprenticeship, the environmental studies students who are drawn to the campus’s farm and gardens, and UC Santa Cruz’s groundbreaking agroecology research and education efforts, the campus is a leader in agricultural studies and training despite its lack of land grant status or a formal agriculture major. Parr received funding from the University of California’s Global Food Initiative to document best practices for experiential learning to share with other universities and colleges. McDonald and Duncans are both part of the first class of environmental studies majors who will graduate with the new concentration in agroecology and sustainable food systems as part of their transcripts. And they’ve both benefited from the “pipeline” effect of the internship, with McDonald now working with Philpott’s research group, where he’s helping with a garden-based biodiversity study, and Duncans landing a job as a student farm manager. Wong acknowledges that although only a minority of interns is likely to pursue a career in agriculture, he sees the chance to expose students to the realities of farming as a critical way to create a more informed and engaged populace. “Whatever fields our interns enter, we’re giving them a way to link policy with practice and a larger understanding of agriculture’s impacts,” Wong said.